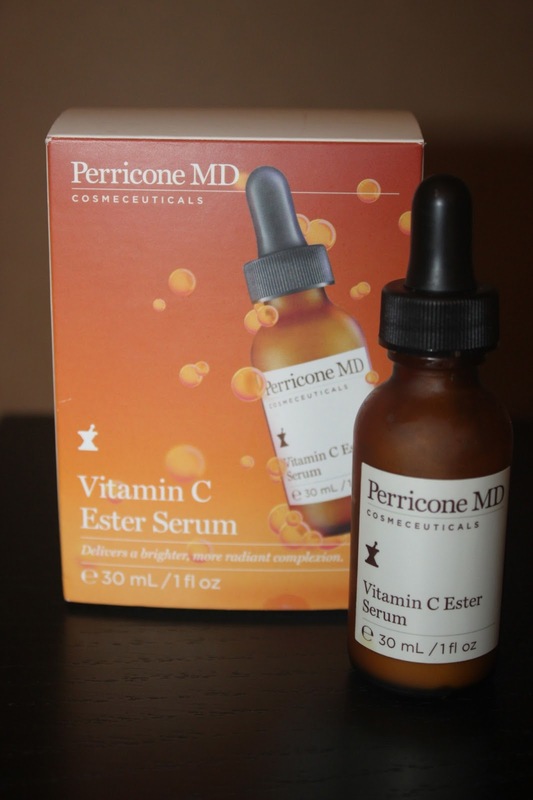 Perricone Md launched the Vitamin C Ester Serum earlier this year. During there fabulous Spring Event I bought it as well as the new Acyl Glutathione serum. I have use it for about 6 weeks now and am loving the results. It come in a bottle with a dropper top. I only need 4-5 drop to cover my entire face including the eye area. This has just given my skin the boost it needed. Since I already use the Vitamin Ester 15 at night and Blue Plasma, my skin’s condition is pretty good. This just nudged it into excellent territory. The serum has a light citrus scent and is light and absorbs quickly. The texture of my skin is fine and clear. I use this in the morning. As far as I understand this Vitamin C serum can withstand use in the day, as it is combined with Palm oil to stop degradation from sunlight (hope I got that right). Besides it’s powerful radiance boosting element it also offers antioxidant protection throughout the day- Don’t forget your sunscreen. I love that this is a multi – tasker and can work to help my fine lines around the eye and lip area. I then do top with my eye cream. I recently went for a mini-facial at a spa and the aesthitician was trying to diagnose my skin and used a fancy machine to measure my moisture levels. The measurements were good ( I have surface dehydration- we live so high above sea level and this can affect this). After the treatment she remeasured in the hope they has improved to show off how good their products were. No change. Good is Good. She could not fault my home care- Thank you Dr Perricone…… and I went home empty handed. While this product specifically does not deal with hydration it has definitely helped in nourishing my skin. This I was told differs from the Vitamin C Ester 15 as it has a more brightening result as is used all over the face and eye area and the Ester 15 while brightening it also has a tightening effect. I love them both and use them in tandem. This is another must have product from Perricone MD. Have you tried any of Dr Perricones products? Sounds like you are really happy with this product!! Pretty funny that the aesthetician measured you after the facial in hopes to sell you something! Had you visited that place before? I went to an Sk-II counter once where they measured all sorts of things including sun damage. Ouch. definitely wish more counters had that kind of tech at the counters!! Anyway…have you already done a review on the blue plasma? I see it all the time in the mags!! I have indeed done a review on blue plasma. I love it- it might dehydrate initially but persevere as your complexion should love it after about a week! I am about to try some deeper home exfoliators, as I am not ready to do the one's offered at the spa'a yet where u can peel and look sunburn't.